(Starting in the upper left) Product development: Developing spinoff products that appeal to your existing customer base. Market penetration: Selling more of what you offer to existing customers. Market development: Selling more of what you currently produce to new customer groups. The fourth strategy, diversification, is essentially different from the others, in that it requires a firm to create new products and appeal to new customers simultaneously. Specialized strategies for diversification include internally developing products for new markets, buying another company to enter new markets, distributing another company’s products, licensing new technologies, and allying with other companies to go to market. The matrix is a great universal tool that always provokes fruitful discussion when it’s employed. But I think it has [at least] one drawback. In particular, because it was designed for a 1960s conglomerate, ITT, it is biased toward large companies with diverse product offerings and deep pockets. In the entire world there are less than a thousand private firms with 50,000 employees, but tens of millions with fewer than 50 employees. These firms tend to have narrow product offerings and not very deep pockets. For them access to financial and human capital, and production capacity, is limited, sometimes severely so. Large firms with sound fundamentals can line up money for growth under most economic conditions. But when lenders talk to small firms, they frequently ask owners for personal guarantees, and keep them on a short leash. Even when money is not the main issue smaller firms typically lack the necessary skills and support staffs to place multiple bets on new opportunities. And, they lack information and knowledge assets that are crucial to growing the company. In short, they lack the financial and intellectual capital that large competitors may enjoy. As a result, when they invest in growth, their survival may be at stake. Small firms do not have the luxury of taking a portfolio approach, absorbing failures in order to find a few hit products. The question of how and where to invest is much tougher to make in this situation, as the downside risk seems greater. These thoughts about the product/market matrix came to mind while talking with Jim Carlson, a facilitator for The Alternative Board (TAB for short). It’s an outstanding organization that brings together groups of small business CEOs who meet monthly work on their core business issues. The CEOs function as an “alternative board” for each other. Jim, a former Hewlett-Packard marketing executive, now works with TAB boards full time, helping firms in fields ranging from retail to law, construction trades to software. “Eureka,” I thought, “This is a new spin on an old idea.” This is similar to the Product-Market matrix, but viewed in a new way. The original focuses on the best direction for future growth, but this one looks at growth barriers, the capacity constraints small firms face. 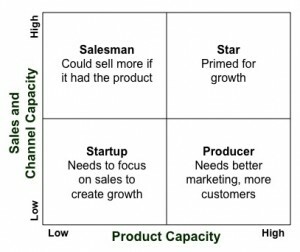 Sales and Channel Capacity: The sales aspect defines a firms ability to market and sell to customers. The channel aspect identifies market demand. Does a firm have the ability to market and sell more? And, is there demand waiting to be filled by its new sales initiatives? Product Capacity: A firm’s product capacity is defined by its ability to produce and deliver. If sales expanded, could the firm produce enough to meet demand? 1. Imagine you are a small family winery—in California there are more than a thousand of them, and competition is intense. You have good products and do a good business in your local area restaurants. And, there are select wholesalers across the country that stock your product. However, sales and product constraints are in delicate balance. There is an old saying in the wine business though that goes “If the wife runs the tasting room and the husband is the winemaker, you can make money.” Meaning that while the winery is small, it may be able to sell out a limited production. But if it adds the overhead of professional staff and tries to grow, finances become challenging. In an industry characterized by a few very large firms and many very small ones, growth invokes all the constraints of money, people, and knowledge. Can the company maintain quality while increasing output? Can it afford to ramp up production since it will increase inventory and material costs, both in growing and bottling. Do the owners have the talent to break into new markets repeatedly, or innovate in existing ones to fuel sales? 2. A small cabinet manufacturer operates with 20 employees in a metropolitan area. Up to now the business has been supplying building contractors, architects, and designers with cabinets for high-end home and office products. The company’s founder has purchased good machinery over the years and calculates that he could double or triple his output if he had the demand. He’s faced with the Sales and Channel Capacity problem. There is a clear need to invest in marketing and sales? But where is the capital to hire new salespeople? What kind of marketing support will they need? And, if the firm decides to invest can it stick to its current geography, selling more cabinets to existing customers? Or will they expand by perhaps selling to new customers in cities 30, 40, or 50 miles away? What impact does that have on current delivery and service costs? 3. A civil engineering firm provides structural engineering reports, environmental reports, and other services to cities and private firms in architecture and construction. The company has a small staff of highly specialized experts. And, it has the ability to sell to more clients but is challenged by the ability to produce the work. Given the cyclical nature of private construction they may not want to take on additional staff in good times. The President is sure the company needs more product capacity, but not sure of the best approach to providing that? Should she add lines that current staff can sell to existing customers? What are the financial, managerial, and other risks of taking on more staff? We can plot businesses, and even product lines, on the graph based on the degree to which they are more constrained by sales or by production capacity. Upper Left: The Salesman. This firm finds it could sell more if it could produce or acquire more product at the right price. It has established good selling programs and relationships that lead to a more or less steady flow of orders. Lower Left: The Startup. Firms that are constrained in both production and sales may be actual startups, or they may be longtime small businesses that have developed neither channel or product capacity depth over time. For some small businesses this is the owner’s lifestyle choice. More sales, or more product capacity, might lead to more work and growth the owner would really prefer not to take on. But for all others, there is a need to develop both sales and capacity scenarios and strategies. Lower Right: The Producer. Firms that are production constrained are challenged to consider a wide array of options. Yes, they have product capacity, but before cranking up the output they need to align it with new sales and channel capacity goals and initiatives. They must ask the key questions of the product-market matrix. Do they want to sell more of existing product to new customers? Or line extensions to existing customers? And, if the capacity exists they could also wrap more services around their existing products, potentially making each current customer more valuable. Upper Right: The Star. This firm has some overhead in both channel capacity and production capacity. It has great growth prospects. Smaller firms in this position are still challenged, sometimes precipitously so. The key questions here are what are the internal competencies and management skills that will support growth along both capacity dimensions. Are the founders up to managing this process? Growth is often a proxy for capital needs in the business, but it is also a proxy for management and leadership development needs. Obviously, firms that are strongly constrained on either the product or channel dimension need to create strategies that harmonize those capacities at a higher level of revenue and profit. Step 1. 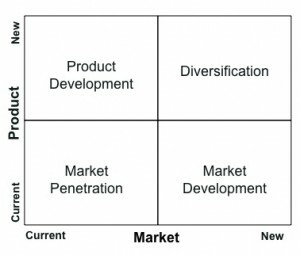 Examine the Product/Market Matrix: Define how your company might grow in terms of Market Penetration, Market Development, and Product Development. Step 2. Now examine the Capabilities Matrix: Which constraints do you face for each of the Product/Market Matrix strategies you chose in Step 1? Have you developed the processes and tools needed to boost sales? Do you make sales a number one priority in our daily activities? Is your current market capable of buying more from you? Or do you also need to diversify offerings and the customers you target, thereby supporting the creation of more channel capacity? Can you produce more of your existing product or service or can you expand your offerings by reselling what others produce? What products are complimentary to your existing offerings? Do you have a strategy to differentiate as you grow capacity? Can you keep costs in line? What is the latency of your product supply? For example, if you sell digital downloads you can add more capacity in seconds. But if you sell wine, your inventory pipeline might take three years to fill. If you sell some of your products through others can your distribution channel ramp up for an increased flow of product?